Forests and other vegetation in South America are becoming increasingly affected by climate change and socio-economic and land-use changes. One of the major problems associated with this development is the increasing vulnerability, occurrence and damages caused by wildfires. In Southern South America fires used for cleaning agricultural and pasture lands are the main causes for uncontrolled wildfires entering natural forests, industrial forest plantations and protected areas. In the recent years large fires exceeded the response capabilities of nations and prompted governments to call for assistance by neighbouring countries in order to manage the wildfire emergency situations. Such mutual international assistance is effective and efficient if participating nations are prepared by bilateral agreements, protocols and commonly exercised procedures. 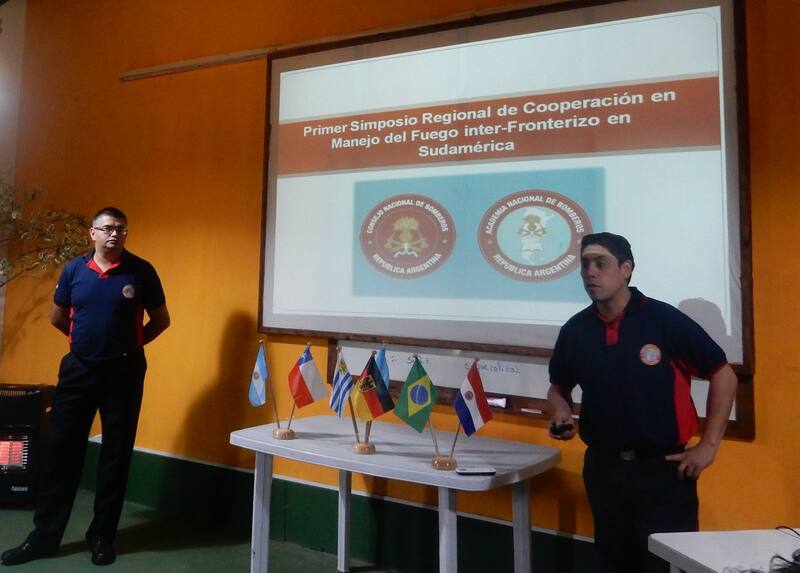 The South America Regional Wildland Fire Network, which is operating as one of 14 regional networks under the Global Wildland Fire Network and the United Nations International Strategy for Disaster Reduction (UNISDR), has initiated the regional dialogue and exchange of information in fire management. It is now important to take the next steps towards the creation of interoperability between neighbouring nations for wildfire crisis management. Common standards for training and firefighting operations are essential for enhancing the preparedness for cooperative safe, effective and efficient wildfire response. The regional symposium, which was facilitated by the Global Fire Monitoring Center (GFMC) and sponsored by the German Federal Ministry for Food and Agriculture based on a decision of the German Bundestag, was attended by representatives of the forest services and fire services of Uruguay, Argentina, Brazil, Chile and Paraguay and observers from other agencies of Uruguay. Regional exchange of information on wildfires occurrence, fire management and fire emergency response of the participating nations: Representatives of each country presented the situation in their home country, including experiences in cooperation with neighboring countries in training and responding to wildfire emergencies. Briefing of participating countries about international initiatives in cooperation in fire management: The work of the Global Wildland Fire Network operating under the United Nations International Strategy for Disaster Reduction (UNISDR) and the voluntary International Wildfire Preparedness Mechanism (IWPM) was introduced by the Global Fire Monitoring Center (GFMC). 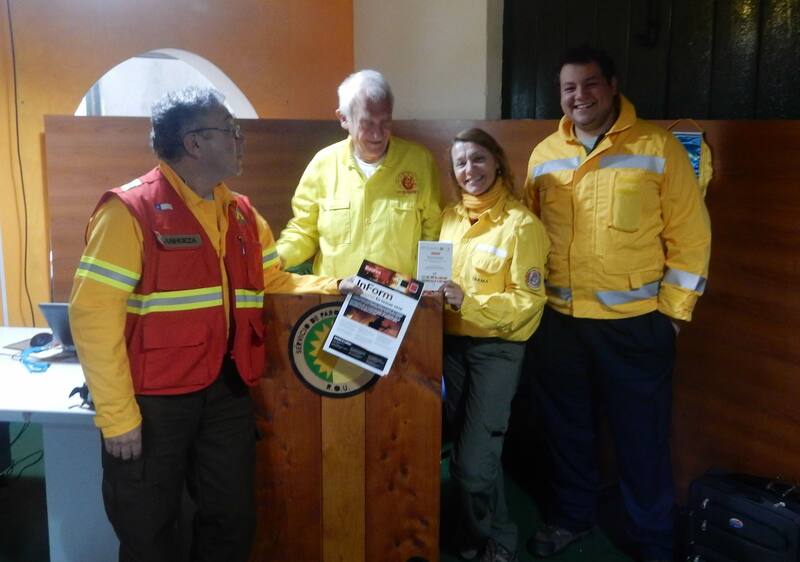 Introduction of training materials for capacity building in cross-boundary fire management: TheEuroFire Competency Standards and Training Materials were presented in Spanish and Brazilian / Portuguese for future in national training, with emphasis for enhancing interoperability between participating South American countries. Furthermore, the concept and draft of the International Fire Aviation Guidelines were introduced. Regional fire management demonstration and exercise: The presence of representatives of the different nations was used to demonstrate firefighting and fire use techniques together with local Uruguayan fire service units and military. Regional Fire Management Symposium: Discussion were held about the future use of the EuroFire training standards for joint regional trainings, as well as the test of the International Fire Aviation Guidelines; development for recommendations for official bilateral agreements or multilateral frameworks within South America to systematically enhance preparedness and response to wildfire emergencies by cross-border cooperation. Encourage more scientific research addressing the socio-economic, cultural and environmental (climate change related) trends affecting fire regimes and fire management in the region; and conduct an in-depth analysis of satellite data on type and extent of areas burned by wildfires or land-use fires. In summary, it is concluded that the symposium contributed to enhancing the visibility, effectiveness, and inter-operability of regional cooperation in fire management. All materials produced by GFMC or IFFN must be quoted properly. Copyrights of materials provided by other organizations or publications and websites hyperlinked with this website must be observed. It is not permitted to publish or otherwise use photographs produced by the GFMC and other providers without a written permission.